By Carl Slaughter: E. Lily Yu burst on the scene in 2012 as winner of the Campbell Award for Best New Writer. E. Lily Yu. Photo by Alice Zhang. That same year, she was nominated for the Hugo, Nebula, and World Fantasy awards for best short story (“The Cartographer Wasps and the Anarchist Bees,” Clarkesworld Magazine, April 2011), as well as the Million Writers Award. In 2012, she was included in year’s bests by Jonathan Strahan and Rich Horton. This was also the year she attended the Sewanee Writers Conference as a Stanley Elkin Scholar. Then 2013 was another busy year, with half a dozen short stories and the Clarion West Workshop. “The Urashima Effect” (Clarkesworld Magazine, June 2013) was nominated for a Sturgeon in 2014, and that year Strahan and Horton again included her in their year’s bests. 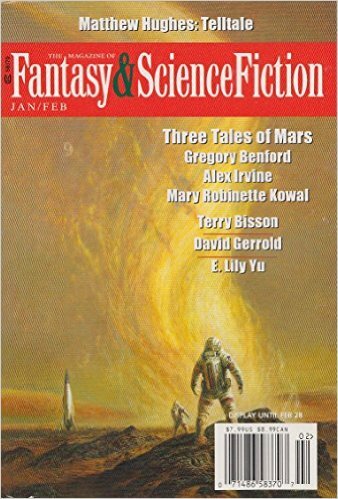 Her latest story, “Braid of Days and Wake of Nights,” was in the Jan/Feb issue of Fantasy and Science Fiction. Lily Yu showed promise as early as 2005, winning a 69-word story contest sponsored by The Writer magazine. She specialized in creative writing at the New Jersey Governor’s School of the Arts and attended the National Foundation for the Advancement of the Arts’ YoungArts Week 2008. Yu is also an accomplished poet and her first published poem received an honorable mention in Ellen Datlow’s Year’s Best Horror. Check out E. Lily Yu’s award-nominated stories “The Cartographer Wasps and the Anarchist Bees” and “The Urashima Effect”. Visit E. Lily Yu’s website. Find more of E. Lily Yu’s online stories. Discover E. Lily Yu’s full bibliography. This entry was posted in Like Show Business and tagged Carl Slaughter, E. Lily Yu, John W. Campbell Award for Best New Writer by Mike Glyer. Bookmark the permalink. I thought “The Cartographer Wasps…” was a gorgeous and intriguing piece of writing. I loved “The Cartographer Wasps..”–I should check out more of her writing. Thanks for posting this. “Braid of Days and Wake of Nights” was great too. Strong Peter Beagle-ish element of seeking something magical in the urban sprawl, but it had its own style and a lot of grief.